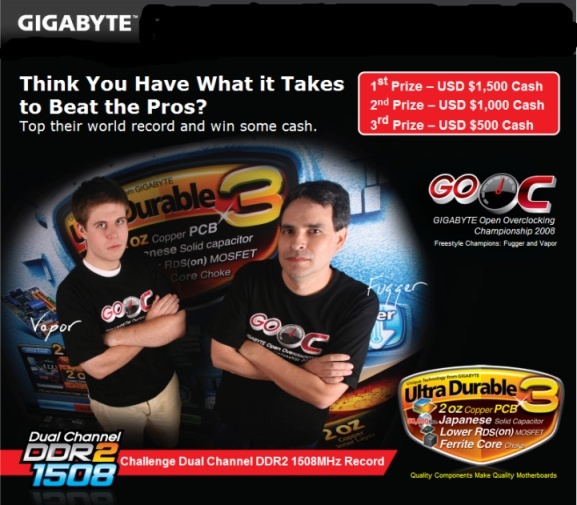 Challenge Dual Channel DDR2 1508 MHz Record, Beat the Pros and Win USD 1,500 ! Can You Beat the Pros? You’ve got top notch hardware gear. You’ve tuned up your GIGABYTE Ultra Durable 3 motherboards to the extreme. Now get ready to challenge the pros to win USD $1,500 CASH. Fugger and Vapor (Freestyle Champions of GIGABYTE Open Overclocking Championship 2008) challenge you to beat their record holding overclocked memory frequency of Dual Channel DDR2 1508MHz. Now you have a chance to challenge the Pros with every purchase of a GIGABYTE Ultra Durable 3 motherboard (eligible are GA-EP45-UD3P, GA-EP45-UD3R and GA-EP45-UD3 only). All you need to do is to break the Pros record – memory frequency Dual Channel DDR2 1508MHz, submit your memory results and be the winner. Join the contest and submit your memory frequency results today. Competition runs till Dec 30th 2008.